From left: Suffolk Construction chief executive John Fish, Vertex Pharmaceuticals CEO Jeffrey Leiden, and former Raytheon CEO Bill Swanson. They meet in secret several times a year, in a nondescript conference room 13 stories above the din of Boylston Street. The cost of a seat at the table? $100,000 annually. But the steep membership fee isn’t what makes this club so exclusive. To join, you also need to run — or have run — one of the biggest companies in the state. 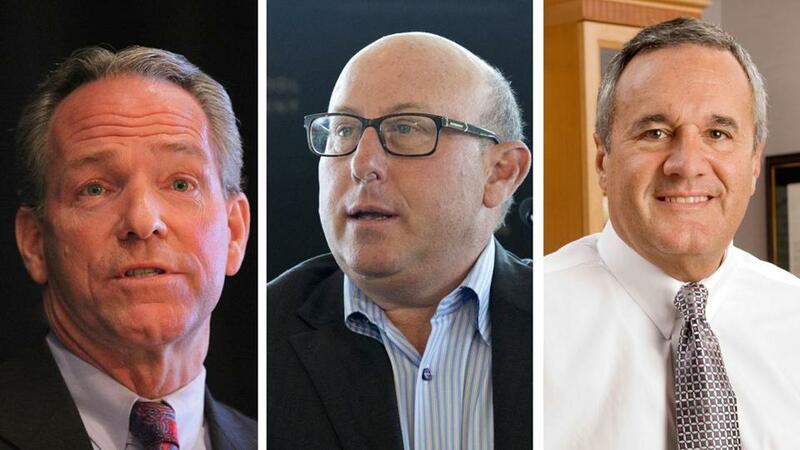 The Massachusetts Competitive Partnership is the state’s most powerful business group, a who’s who of Greater Boston’s corporate elite, with top executives from Fidelity, Bank of America, Vertex, and the Patriots, among others. The partnership’s hallmark is its privacy. Most people have no idea it even exists. The group usually steers clear of the news. Its 15 members — all but one of them white males — don’t hold the networking breakfasts or rubber-chicken dinners that are the staples of Boston’s other business associations. Who’s part of the Massachusetts Competitive Partnership? The group consists of executives from some of the biggest companies in the state. It has regularly been dubbed “the New Vault,” a nod to the now-defunct crew of chief executives who plotted Boston’s future a generation ago, a storied group whose cast of characters were so powerful that they were considered a shadow government at one point. Like the Vault, the Partnership has used its influence to sway major policy decisions. For example, the group helped bring international flights to Logan Airport and worked to block the offshore Cape Wind project. But it splintered on last year’s effort to bring the Olympics to Boston. Six years after the group was formed, questions remain as to whether it can ever be as successful as the Vault, or whether the industries that make up the economy here have simply become too diverse and too global for one group to wield that much influence. But while there’s some grumbling, it’s hard to find anyone who will publicly criticize the partnership or its concentration of corporate power. Few want to risk alienating some of the most well-connected people in the city — and other observers are still wondering if the partnership can reach its full potential. “If you put together 15 superheroes and make a team of them, and set them out to accomplish something, it has to be something big,” said Ralph Whitehead, a journalism professor at the University of Massachusetts Amherst and a confidant of Senate President Stan Rosenberg. So what is that something big? Dan O’Connell, chief executive of the partnership, said it’s considering ways to diversify the membership. Former Raytheon Co. CEO Bill Swanson, the partnership’s chairman, and Dan O’Connell, its chief executive, would say that kind of question misses the point. They’re not the Vault. The partnership members aren’t looking for a home run — more like a series of singles and doubles aimed at steadily improving the state’s economic health. Swanson points to last week’s unveiling of a digital health initiative, a rare public event for the group, as an example. Vertex Pharmaceuticals’ chief executive, Jeffrey Leiden, a partnership member, said the effort was born out of a goal to use the state’s strengths in life sciences to foster a growing aspect of the tech industry. That focus on statewide economic development underscores the crucial difference between the partnership and the Vault, whose members’ focus rarely drifted beyond Boston city limits. But it is still helpful to look back at the Vault to understand what an elite business group can accomplish. Formally known as the Coordinating Committee, the original group was launched in 1959 to help revive Boston’s fortunes as the city flirted with bankruptcy. Bankers dominated the room, but other types of corporate names were represented: Filene’s, Liberty Mutual, Jordan Marsh. The group worked with then-mayor John Collins to help the city avoid receivership. It soon had authority to influence policy within City Hall, helping Collins realize his ambitious urban renewal agenda. At the time, Boston’s economy was largely contained within the confines of the newly built Route 128. Local banks held the city’s bonds and as such were major lenders to the city. There was a vested interest in getting things done. But waves of corporate mergers had weakened the group by the 1990s, as out-of-state giants gobbled up some of Boston’s biggest companies. Boston increasingly felt like another branch town. Suddenly, many of the people calling the shots were in other cities, not here. The Vault became an anachronism and unceremoniously shut its doors for good in 1997. Flash forward more than a decade. Massachusetts was finding its way through the Great Recession, when a small group of local executives worried about the state’s competitiveness started talking about creating a modern-day equivalent of the Vault. Of the old Vault’s members, only Eversource Energy CEO Thomas May and longtime banker Chad Gifford became part of the new lineup during the partnership’s official start in 2010 — and Gifford would soon be replaced by protege Brian Moynihan, Bank of America’s chief executive. Bankers and lawyers no longer dominated the room, as they did in the Vault. Many of the executives at the table ran national or global companies. Fidelity’s Abigail Johnson is the only woman on the panel. But as with the old Vault, white men still call most of the shots. 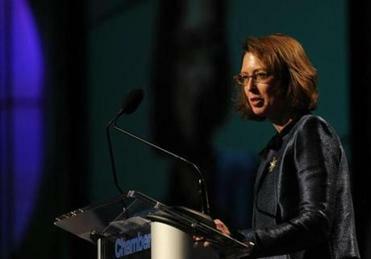 Fidelity Investments’ Abigail Johnson is the only woman on the board, and there are no minorities. O’Connell said the group is considering ways to diversify the membership, possibly by adding seats. In its first few years, the partnership worked quietly by lobbying on Beacon Hill for initiatives such as curbing state retirement costs and reforming the community college system. None of these efforts, though, were as memorable as the Vault’s biggest projects had been. But about two years ago, Fish floated the idea of a Boston-hosted Olympics — the kind of ambitious project some in the group had looked for. 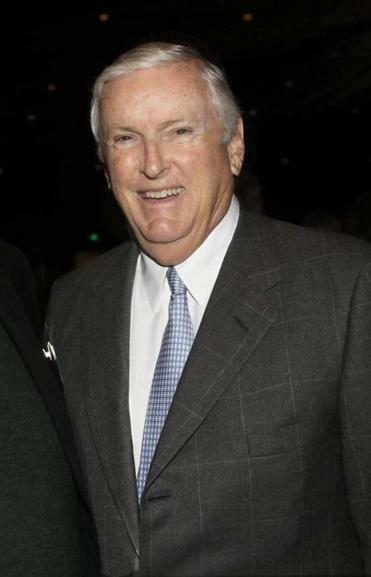 O’Connell, Fish, Putnam Investments CEO Bob Reynolds, and New England Patriots owner Robert Kraft all signed on initially. But the partnership’s members couldn’t reach a consensus, as some were wary of the project’s viability and worried it was too far afield of the group’s core mission. 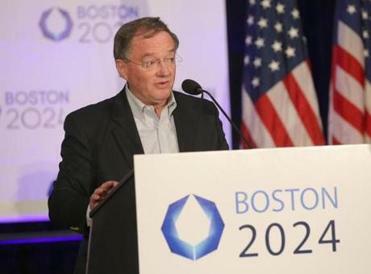 Fish and O’Connell went out on their own to develop Boston 2024 as a separate initiative. “If that had been part of their win-loss record, that would have been a big loss,” said Whitehead, the UMass professor, referring to the collapse of Boston’s Olympics bid last year. Ask Swanson, the current chairman, about the partnership’s track record and the Olympics won’t even come up. He points to Learn and Earn, a job-preparation internship launched at Bunker Hill Community College, an effort funded by the group that has helped nearly 400 students in the past four years. Or the Working Cities Challenge, a contest administered through the Federal Reserve Bank of Boston to fund government-business partnerships that help mid-size industrial cities such as Lawrence, Salem, and Chelsea. But some in the business community wonder if Boston needs another business group, one that could potentially dilute the voice of existing ones. Supporters say corralling the CEOs of the state’s biggest employers in one room provides a rare venue to gauge what’s important to major employers, quickly direct resources toward a particular cause, or rally some heavy-duty firepower to make public policy changes happen. “[T]o have a council of CEOs is arguably the most powerful forum for business in this state,” said partnership member Jack Connors. And if a big out-of-state company is weighing whether to expand here, Governor Charlie Baker and his aides can turn to a local CEO to help with the recruiting. For example, partnership members have helped court General Electric, which is considering Boston for its new corporate headquarters. Massachusetts Port Authority CEO Thomas Glynn agrees: The partnership’s CEOs have helped convince more overseas airlines to come to Logan. Yes, they said, you’ll have enough customers for your business-class seats. Eric Rosengren, CEO of the Federal Reserve Bank of Boston, said he found the partnership’s assistance invaluable as he set up the Working Cities Challenge. Replicating the model, he said, has been tougher in Rhode Island and Connecticut without a similar group in those states. Not everyone has been pleased with the partnership, though. The group lobbied in Washington to ensure the Cape Wind project got only a limited federal loan guarantee, out of concern it would drive up electricity costs — resistance that angered some of the project’s supporters. Mike Widmer, the retired Massachusetts Taxpayers Foundation president, said the partnership, like other business groups, faces a broad challenge: Can it remain relevant with the shifts underway in the local economy and the shrinking number of local headquarters, as exemplified by Dell’s pending acquisition of EMC? Some say the region has changed too much for any group to hold the same sway over the economy. The Boston of today is not the same as the Vault’s Boston. The challenges are more complicated, and the competition for everything from talent to market share is more global than it has ever been.